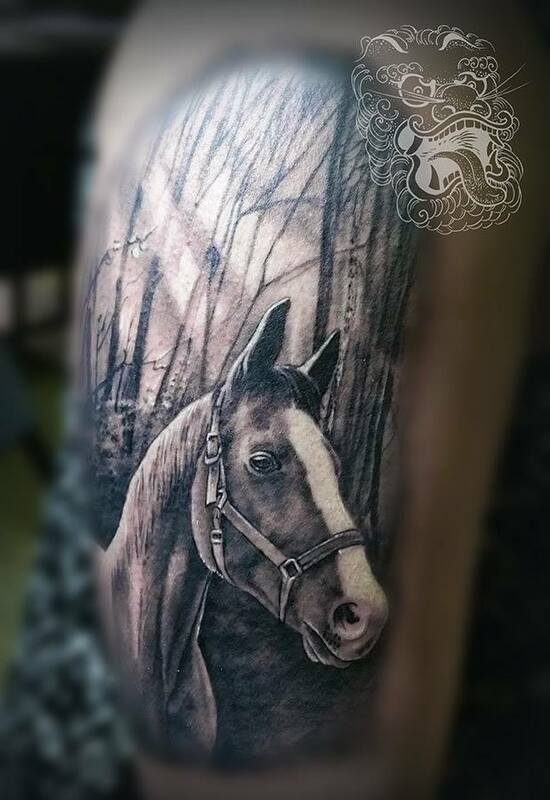 Realism tattoos — Malan - Top Realism Tattoo Artist working from Germany, Neuwied. Realistic tattooing is what I do most of the time. If You flick through this website, You will find out that almost every category of my work fits into realistic tattooing. Realism is more style than subject matter. It is the way I paint and tattoo. Striving to portray things, way I can perceive them. Literally. 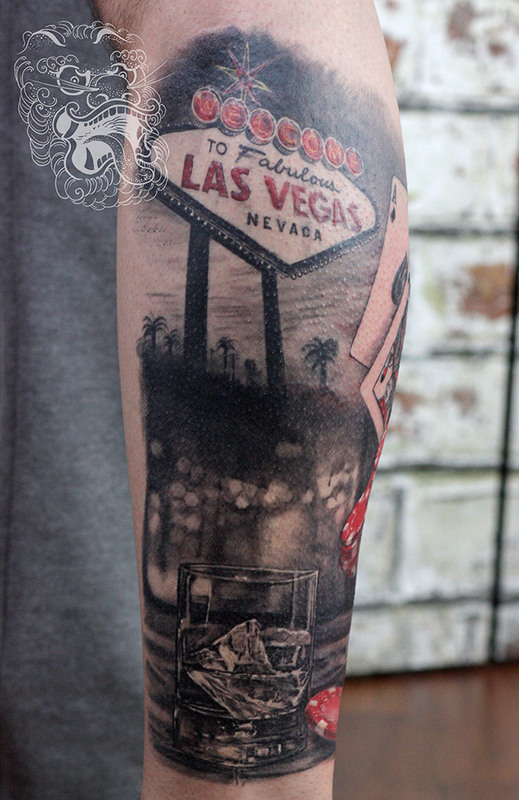 This tattoo was done in a hiper-realism way. Especially if glass and chips are considered. Usage of red leans toward trash polka tattooing. Red is often used in a tattoo when a customer is not sure about the full color, but in the same time, he would love the slight hint of color, that creates additional focal points in the composition. Realism tattooing has a huge tradition. It started with simple drawings of faces on the skin. The difference between those "ugly faces" of past and modern skin art is the quality of tools and knowledge of artists. Today there are no boundaries for modern realism tattooing. What can be drawn, can be also tattooed. Even though reds suggest trash polka style, I like to differentiate my style from it. Trash polka is usually very trashy - only big shapes, lack of detail, concentration on clearly understandable, big areas of contrast. My realism and hyper-realism influence takes it further. I use splashes, highlights of red, but I maintain the same level of detail that I would introduce in any other piece of main. For realism tattooer, there are no sets of subject matters that have to be perfected and anything else matters. Realist has to be ready to tattoo everything that can be perceived. It is absolutely contrary to tribal or ornamental tattooing where only a few motives and conventions have to be memorized and perfected. This reproduction was done on the tiny girl's arm. Size quality brought another level of complication. This picture shows a healed piece. With proper planning of tattooing sessions, this level of detail was possible. I have always enjoyed master studies, mainly from artists I admire so much as Johannes Vermeer. 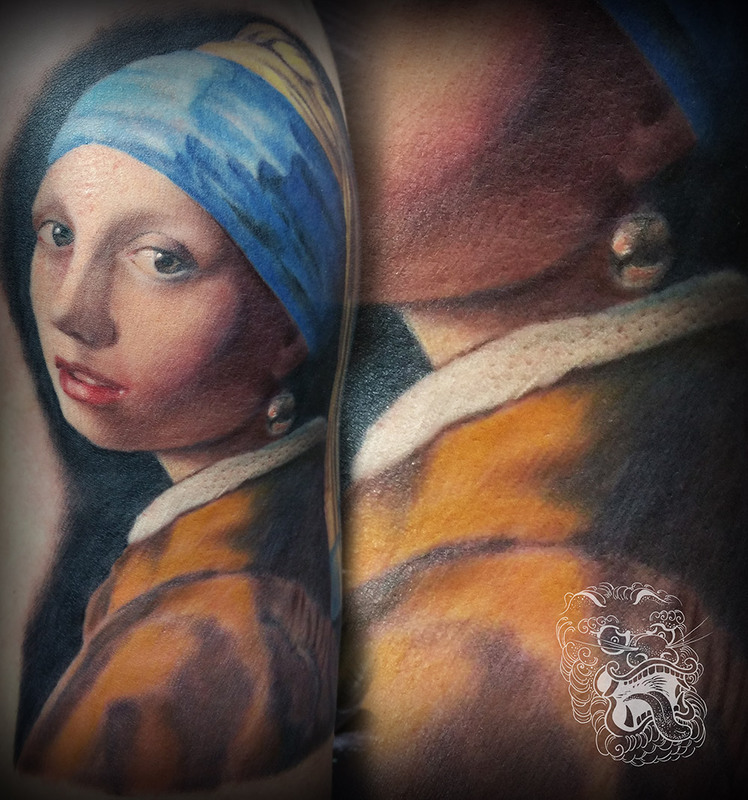 This Girl with a Pearl Earring reproduction I did for an art history student. Space theme is a vast subject matter. It takes tattooing a bit of this planet. This tattoo was one of my first realism tattoos I ever did. Customer requested the particular type of cottage house. I remember I had to invent almost everything straight from my imagination, as still stay true to Irish cottage house landscape. Since that time I learned and my tattooing changed a lot, but I feel this piece was an important one. As it nicely shows my influences and direction I took later on. I never thought about realism, as being a slave to references. Adding elements from "another dimension" or mixing them together in a weird way to create a new image, all of that I believe is part of realism too. Because of that, it might be hard to draw the line between illustrative style, surrealism and pure realism in my works. This tattoo tells the story of esoteric roots. But all the elements have meaning here, including wooden swing. Different colors stand for chakras. In tattooing, we often face a problem of meanings versus economy of components. I feel that surreal approach is often the best solution. This screaming hand I did in surreal tattoo style. The idea is relatively cartoonish, but I decided to take it further applying rules of realism. For this tattoo, we used the face of customer's sister and my hands. So all the references we collected independently. This method of working, in my opinion, is the best way, and whenever possible, I try to work in such a way. There is plenty of subject matter strictly connected with tattooing. Watches is along with many other very important and is always coming back. Today I see artists struggling with working with the same subject over and over again. Although it is a demanding task to stay fresh, it is important to notice that some of the subject matter in tattooing is so strong, that will always stay as an important element. 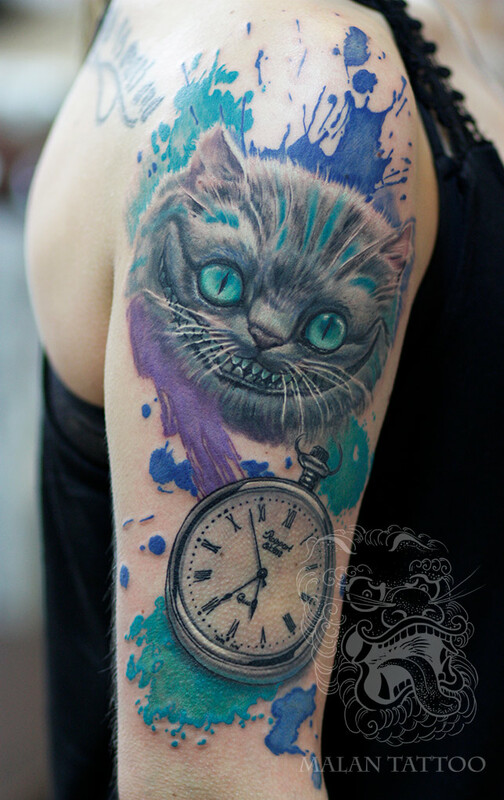 Not all watches tattoos have to be made in black only. Color, when smartly used can help a lot with creating shiny elements. 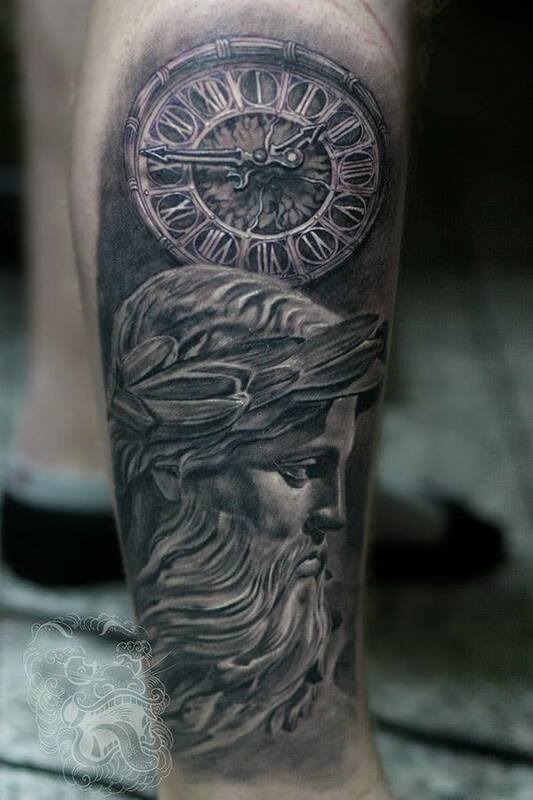 The picture above shows what a classic combination of realism tattooing is. On this big arm, I was able to make a much more detailed watch. Please notice the date of birth and a name on the piece of paper in the background. Putting names and other text into composition is my preferred method of combining those hard to connect elements. I try to make them part of the design, instead of throwing them randomly. Watches tattooing lay in what I believe to be hard area for many realist tattooers - technical, architectural, almost mathematical objects. Naturally, most realists have a slight tendency to lean towards organic objects. That creates week points in all areas of technical objects. And the world contains both of them! One contrasts with another and can be a perfect complement. In this design, I played a bit with perspective. Petal over the watch, and then again lid over the rest. I believe that each artist should look for appealing qualities that build his taste and style. For me, playing with perspective and little add on's like in here, work well. Add a hint of hiper-realism tattooing, and bum - here is my style! Since I started tattooing, I was drawn to "size quality" in tattooing. I admired the most (and I still do) big, full body pieces with fantastic flow and composition. But my road of education went through the heavy influence of artists working with high detail. With time, as my skills progressed I became seen as a perfect choice for detailed hyper-realistic tattooing. So today I see myself as an artist that loves and understands work with bigger pieces, but at the same time keeps areas of extreme detail. In the picture above, notice the clock. Main ornaments are done in white, in this case, that means leaving the untattooed skin. Creating images with untouched skin in realism tattooing (negative shapes) is extremely hard to achieve and requires a significant amount of patience. 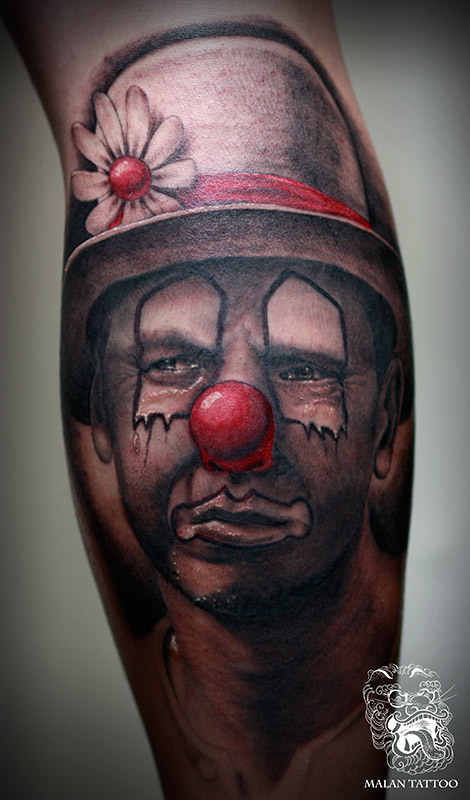 For this tattoo, I took a picture of my customer and then painted over it to create a sad clown. The trick was to keep facial ornaments and changes and stay true to man's face at the same time. Barber half leg sleeve I did for my customer. Many of the elements we chose from his repertoire of tools. Please notice hand. We used his arm holding scissors, but my friend insisted on making hand look "older." If you follow the scissors, you can notice it's stripy texture. It is Damascus steel. Hyper-realism is about that level of detail.